Module view of a large pirate ship/homebase. FULL SIZE picture at the end of this post. This post will be about ship modules in Rogue Ambassador. The picture above was drawn to depict the variety of modules in the game. First of all, any ship modules in RA can be installed into a ship only if the ship has a relevant free module slot. All module slots take only a single type of modules and belong to one of these categories. Let's look at weapon modules first. They are again divided into four categories, each with it's own pros and cons. Kinetic - cannons of all sorts, shots ignore energy shields but are inaccurate, have short range and slow reload. Energy - generally strong long range weapons, such as different lasers. However, energy weapons are blocked by energy shields. Missile - Guided rockets of all sorts. Missiles pass harmlessly through energy shields, but can be shot down by various Point-Defence weapons. Capital Weapons - these are very large single-shot missiles, often capital nuclear missiles or other weapons with huge damage potential. Each missile counts as a single module and will be gone after the weapon has fired. Capital weapons are more extensively covered in this post. Each of those categories will of course feature a large variety of individual modules. There will be obsolete versions, custom-tinkered versions, reinforced modules with extra armor (because modules can be damaged or destroyed in combat), and biomechanical technology versions with their own quirks. These slots host everything that isnt a weapon or engine. 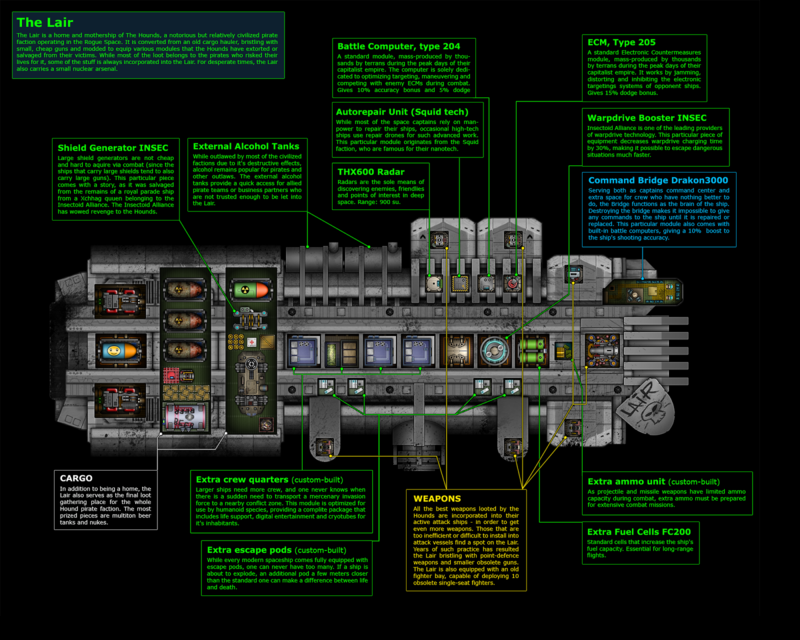 Non-military ships (especially science vessels) often contain a variety of advanced misc modules. Shield: Creates an energy barrier around the ship, protects only against energy weapons. ECM: electronic counter-measures. Increases ship evasion bonus. Some might also confuse missiles. Battle computer: counters the ECM system. Increases weapon accuracy for ship. Fighter bay: prints a limited number of spacefighters out of 3D-nanotech printer. You can launch your crew into battle onboard these. As long as the module itself stays intact, you can always print new fighters in the next battle. Command bridge - place for your Captain and Crew. More advanced versions come with integrated ECM & Battle Computer bonuses. If your ship has not enough crew (or no captain! ), it's performance will suffer. Ramming booster systems - These systems are specifically designed to enhance ramming enemy ships with your own in close combat. System of hatches, structural hardpoints and defence charges are installed into the ship to make more damage on ramming impact and also significantly increase durability. Warp drive booster - All ships have warp drives which can be activated to escape from combat via warpspace. However, the warp drive usually takes a fair amount of time to charge up, and during charging, the ships can't move. This makes any device speeding up the process a potential life-saver. Extra fuel tanks - Fuel is consumed only in interstellar travel, but it is one of the most valuable resource in space. Some aliens even use it as intergalactic money. Exta escape pods - While all spaceships are equipped some, the additional pods increase crew's chances of getting out alive from a ship about to explode. Self-destruct unit - As long as remnants of the Slaver Alliance persist, some captains like to keep the option of "quitting" available at all times. The few people who have managed to escaped the Slavers have expressed regret over not taking their life when they had the chance. Radars - Your fleet always uses the best radars carried on any of your ships. Radars mainly determine the visible range and detail of interstellar starmap. Got any cool ideas for modules or general questions about the game? Let us now in the comments! One possible room to add would be a cell for criminals with a bounty on their heads. Anyway I'm still loving the artstyle. thanx, cool idea :) For time being, surviving pirates and other dangerous elements collected after battle will be kept frozen in cryotubes (which can be held in the ship cargo area). Great job guys! looks effing cool.